In a large skillet, heat 1/4 inch of vegetable oil until shimmering. Add half of the sliced shallots and fry over moderate heat, stirring a few times, until they are browned and crisp, about 3 minutes. Using a slotted spoon, transfer the fried shallots to paper towels to drain. Fry the remaining sliced shallots. In a large bowl, whisk the olive oil with the sherry vinegar and season with salt and pepper. Add the mesclun and blue cheese to the bowl and toss. 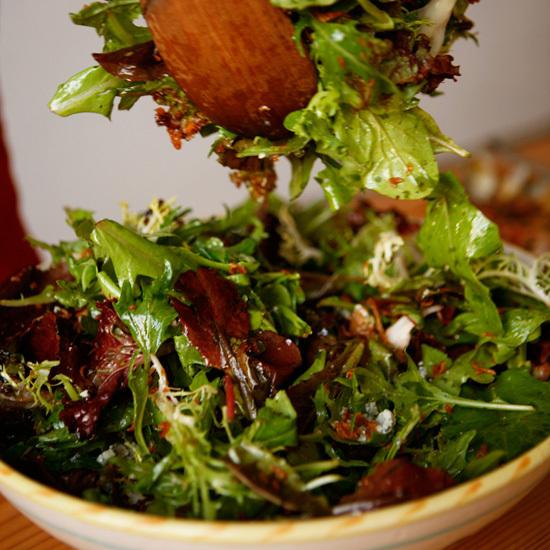 Sprinkle the fried shallots over the mesclun salad and serve right away. The fried shallots can be stored in an airtight container overnight.